Here’s what Napa dentist Dr. Hoey recommends you use at home and why! Mouthwash and Toothpaste Antimicrobial mouthwashes are best at combating bad breath, and to fight plaque and gingivitis, keep an eye out for the active ingredients cetylpyridinium chloride and chlorhexidine. For sensitive teeth toothpaste or mouthwash that contains potassium nitrate can help in decreasing sensitivity. And avoid trendy charcoal toothpastes, as they can be too abrasive and do not remove plaque as effectively. Toothpaste and mouthwashes that contains hydrogen peroxide and baking soda can whiten teeth over time and continual daily use of products like this will also help whiten your teeth safely. Make sure to speak with Dr. Hoey before starting a whitening program at home and ask if your products are safe for you personally. Floss Choose the traditional floss string you wrap around your fingers over those bulky floss sticks. The excess plastic used to make the sticks is bad for the environment and the design does not allow you to reach important areas around the tooth as easily. 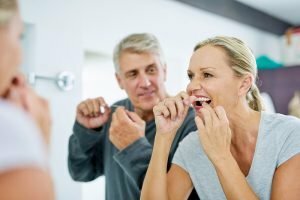 Napa dentist Dr. Hoey suggest flossing at least once a day to maintain your oral health. Manual toothbrushes The maximum lifespan for a manual toothbrush is 3 months. After three months the bristles become less effective at removing plaque from your teeth and gums. The active bacteria on a toothbrush after three months of use is enough to encourage anyone to buy a replacement asap. Soft or even extra soft bristles are the best for your at home oral health routine as well. Medium or hard bristles can hurt your gums and are actually less effective at removing plaque from your teeth. And choose a brush with multilevel or angled bristles. These types of brushes will substantially outperform flat-trimmed bristles for overall plaque removal. Electric toothbrush We are fortunate to be living in a time full of technological advancements that help us live happier and healthier lives. Some clinical studies have shown that an electric toothbrush removes plaque from your teeth and gums 21% more effectively than manual brushing. If using an electric toothbrush as part of your daily routine, Napa dentists Dr. Hoey suggests making sure your brush has a round, oscillating head. An electric brush with a 1 or 2 minute timer can be helpful to ensure you are brushing for the appropriate amount of time as well. If you want to find out if your dental tools at home are up to the job call Napa dentist Dr. Hoey at 707-254-7600 today.